Hero Battles: Selectable On the side of the Empire from the beginning. 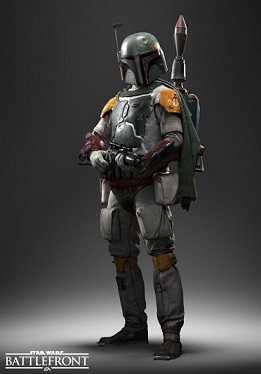 Hero Hunt: Here Boba Fett is one of the hunted heroes and can be allocated from the beginning. Heroes vs. Villains: playable on sides of the empire. Hegemony: Can be found on the empire side as a hero-power-up. Walker Assault: Can be found on the empire side as a hero-power-up. Boba Fett is a cunning bounty hunter who has already done a lot of tasks. He is ready for anything; he has his Mandalorian battle armor full of gadgets and weapons, which you can also use in Battlefront. Above all, his jetpack and his arsenal of melee and ranged attacks make Boba Fett very versatile hero who brings the following equipment and skills. - EE-3: With his Blaterpistole, Boba Fett can make high damage from a distance. - Jetpack: With the alternate fire button Boba Fett can use his jetpack and fly. This is an important skill, because as you come virtually anywhere on the battlefield and can attack enemies from the air. But pay attention to the power indicator of the jetpack, because if it is empty, you can no longer fly. The energy renews itself, as long as you are on the floor. - Flamethrower: Boba Fett can use it for melee attack and causes a lot of damage. Flamethrower is also suitable for surface attack and the damage is not blockable. - Rocket Launcher: A small rocket like a grenade fired in a straight line. Very effective against other heroes, enemy groups or vehicle used - they can not block. - Leverage your jetpack as often as possible, because a flying target is harder to hit. - Pay attention to the energy bar of jetpacks, so you don’t run out of boost in dicey situations. - Use your high mobility from optimal and often changes the position. - Boba Fett cannot block hit, so keep moving to avoid being hit. - The flamethrower is well suited for surprise attacks in the rear of the enemies.